Despite Pinterest’s rapid great success over the last few months, there are still many people and businesses that don’t know what it is or what it can do for them. As the site gains even more momentum, there are a lot of benefits to getting on the bandwagon early. Pinterest is an online forum where people and businesses create and maintain pin boards of images and videos that can be ‘shared’ and ‘liked’ by other users. In short, it’s a community of visually-oriented, avid potential shoppers. When people re-pin an image of a product or service, they’re sharing that content with everyone that follows their own pin boards. 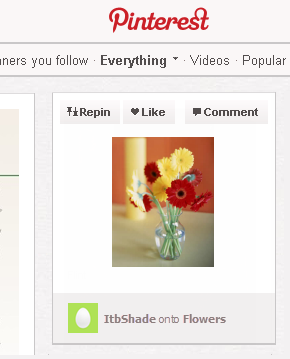 For example, if The Budding Flower Shop pins a picture of a particularly beautiful floral arrangement to their “Flowers” board and ‘Jessica’ re-pins it, then all of the 87 people following Jessica will see it too. Each image that gets pinned is attached to a URL. So when someone clicks on your pin, it will open a new tab or window, taking them to the source of that image. Talk about driving traffic to a website! With your Pinterest account, you can create as many boards as you would like. Galleries can showcase work by pinning on an Artist’s or Artwork board. Restaurants can display images of signature dishes or weekly menus by pinning on a Food board. Salons could showcase the impressive work their stylists do by pinning on a Beauty board. Nonprofits can display pictures from their recent initiatives. Retailers could pin images of their products and services. And of course, all businesses can pin to create engagement. This means post images of things like Do-It-Yourself activities, images that link to recipes, and images that are part of a contest. So what do you need to do to begin sharing? In order to get started, you have to request an invite from Pinterest or receive an invite from a current Pinterest user. Once you have completed signing up for an account, just create a few boards and start pinning. Add a Pinterest link into your email or invitation.Lead your current and new contacts to your Pinterest page by inserting our Follow on Pinterest icon into your email or invitation. Start editing your email in Constant Contact. Click the Edit icon for the block where you want to add a Pinterest button. Place your cursor where you want the Pinterest icon to appear. On the left-hand side, click the Social Media button. The Insert Pinterest Link window appears. Select the image you want to use from the available choices. In the Link field, copy and paste the URL for your Pinterest page. Click the Insert button. Click the Save icon. Add your Constant Contact newsletter to Pinterest. Now, you’ve got to subscribe to our Archive feature for this one. But if you archive your Constant Contact email, you can pin your archived email to your Pinterest board. When that pin is clicked on, your email newsletter will open up for that person to see. After logging into Constant Contact, click Email > Archive. Click the “URL” link located to the right of your desired archived email. Copy and paste the URL to a web browser. Click the Pin It button that you added to your Favorites Bar. Hover your cursor over the image you want to pin. Click the Pin This button that appears over the image. Note: If you decide not to pin any of the images, click Cancel Pin located on top of the page. A window appears with the image you chose. Click on the drop-down menu located to the right of the image and select or create your board. Type in a description in the Describe your pin field. It’s that simple to make Pinterest a part of your business. And while you should think about your audience before deciding which social media network is right for you, Pinterest is a great way to highlight a business’ most photo friendly products and services. Are you using Pinterest for your business? Tell us how below. TiAn Vetter is a Knowledge Base writer who enjoys writing blog posts and helping small businesses with their marketing efforts.